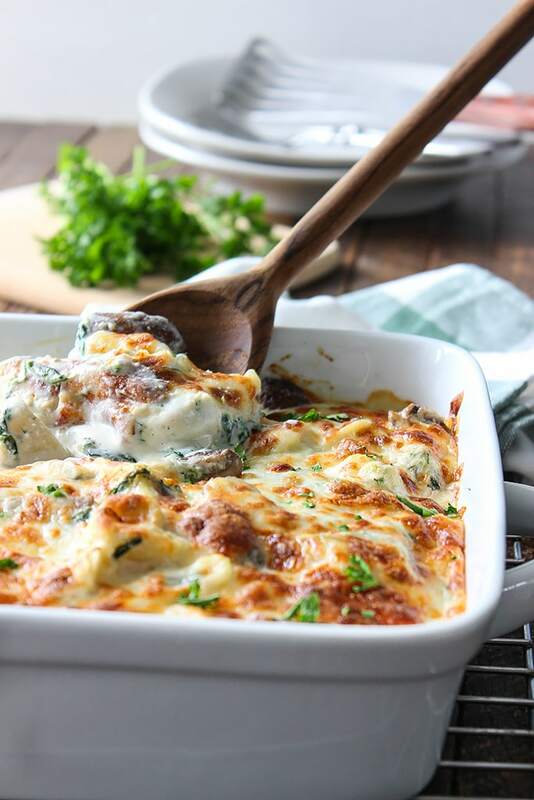 It’s been awhile since we’ve done a pasta bake, not since the cheesy hot Italian sausage bake we did awhile back. 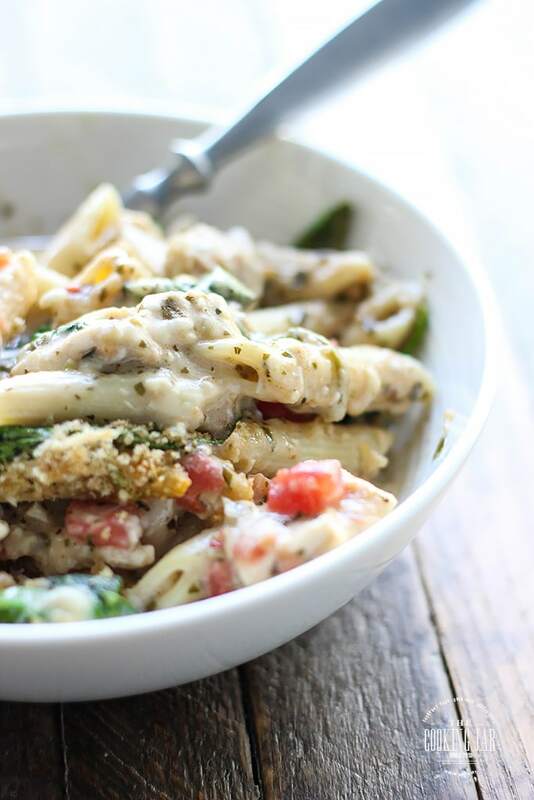 So today we’ll be a doing a pesto chicken pasta bake! 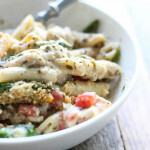 This one is slightly Alfredo-y, like my chicken Alfredo pasta bake but also has a taste of pesto and with less of a cheesy top. Instead, we have cheese in the pasta itself, a six cheese Italian blend all mixed up with the Alfredo sauce. There’s also tomatoes, spinach and chicken to go with it and a generous layer of Italian bread crumbs and Parmesan. All of the ingredients are store-bought items which makes this super easy to put together. I even used rotisserie chicken here so we didn’t have to pre-cook the chicken. Of course, you can make your own Alfredo sauce and cook your own chicken; grilled, pan-fried, whatever way you want. But the emphasis of the recipe is to get a full family-portioned meal with as little hassle as possible. So let’s begin. 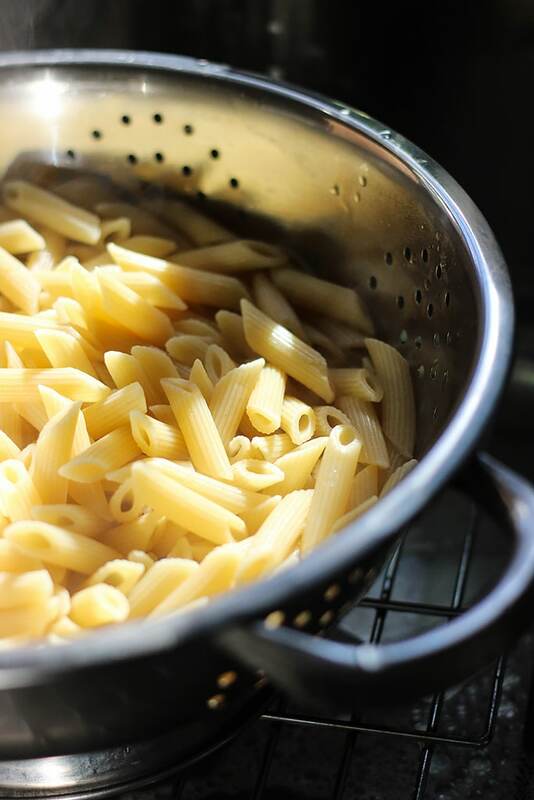 Start by cooking your pasta. You’ll want to cook it till it’s just before al dente since it will cook longer in the oven and you don’t want soggy pasta. So take it off the stove once the pasta has expanded in size but is still a little chewy. After that, drain the pasta and rinse it under cold water to stop the cooking process. 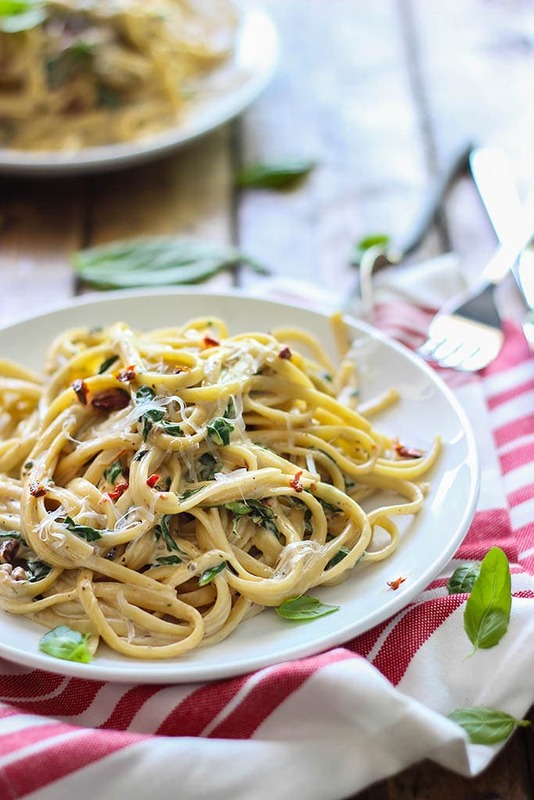 While you’re cooking the pasta, start cooking or pulling apart the rotisserie chicken. You should get about 3 cups worth of chicken when all is said and done. 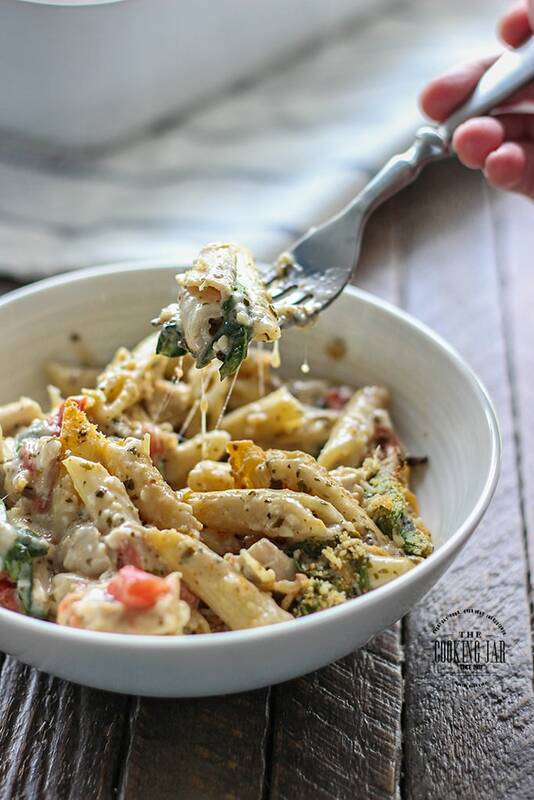 Mix up the chicken with the cheese blend, spinach, tomatoes, Alfredo sauce, milk and pesto. 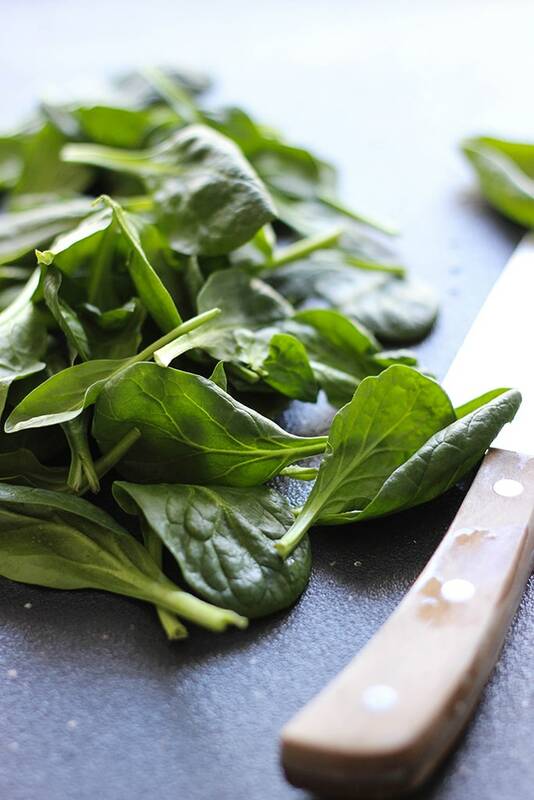 You’ll need a huge prep bowl for this because the fresh spinach tends to be bulky, or you can do it in the casserole dish itself. Once the pasta is cooked, drained and rinsed, add to the chicken mix. Mix, mix mix! I found I spent more time carefully mixing it then I did any of the other prep work. Once that’s done, transfer it to a casserole dish and top with the Parmesan, Italian bread crumb and olive oil mix. Then we bake! It should take about 30 minutes or so, since all the ingredients are already cooked. The baking part is just to marry the flavors together and melt the cheese topping. At this point, you can take the 30 minutes to start a side dish, or finish washing up, or write up this post like me. Great to hear! Thanks so much for trying out this new recipe, Erika. I made Chicken Pesto Bake and it was delicious. I just didn’t add the spinach. Everyone loved it who tried it. ?????? This was amazing! Such a good recipe. I added some fresh chopped garlic to it. Thank you! Yum, garlic! Great addition. Happy you liked it, Rob. 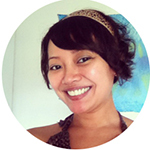 I’m also a food blogger – a little fish in a big sea. Love your every day approach, especially now – we are in the process of moving, so my kitchen in half-packed – making preparing delicious meals for my guys a bit of a challenge. This was perfect after a day of house hunting in another city. Thank you. Oh it’s a very big sea indeed! So many of us out there 🙂 I do like to offer alternatives to busy cooks that want something more than takeout or frozen stuff but still need short cuts. There’s a little something of everything here for everyone, I’d like to think! 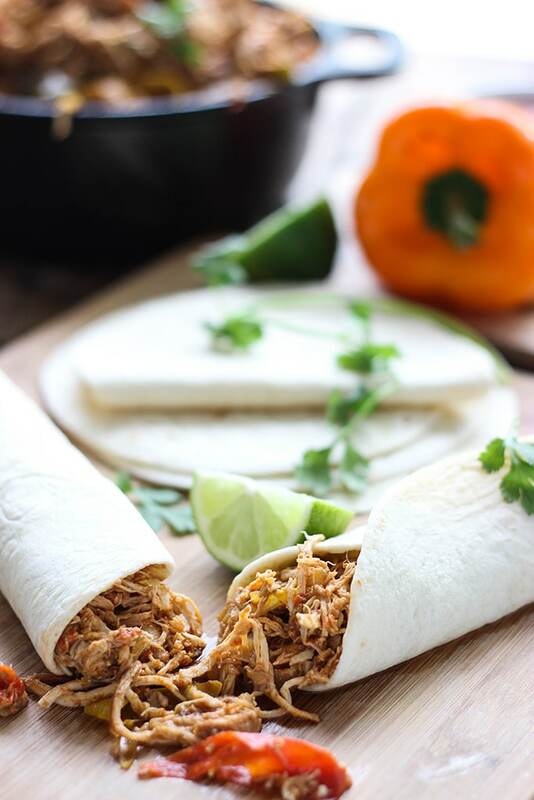 This is a great easy recipe that’s delicious. I added frozen peas and broccoli (which I lightly steamed) to add more greens. My flatmates loved it. Thanks for trying it out and sharing it, Sara!